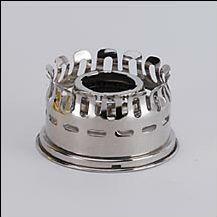 The Aladdin Heel-less Gallery (top) is a common replacement part for the Aladdin burner. Galleries can get dented, damaged, or go missing from the lamp all together. The Heel-less Gallery fits on Aladdin Lamp burners, Models 6, 7, 8, 9, 10, 11, 12, A, B, (some Model C's but not all), 21, 21C, 23, and 23A. This gallery (top) is designed for use with Aladdin Heel-less Chimneys #R910. 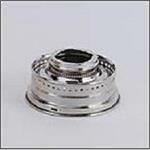 Use the #N239AB Heel-less Gallery to convert any Aladdin Lox-On Burner to Heel-less. Why convert my lamp from Lox-On to Heel-less? The Heel-less Gallery is also referred to as a "Slip" Style Gallery, due to the fact that the smooth base of the Heel-less Chimney simply slips into the gallery, rather than the twist and lock design of the Lox-On Chimney. Replace a missing or damaged gallery (top) on your Aladdin Lamp.